Ha kusan, Japan, November 19, 2015 – EIZO Corporation (TSE: 6737) today announced the release of the RadiForce RX350, a 21.3-inch 3 megapixel monitor ideal for displaying chest X-ray, CR, and DR grayscale images and color images such as 3D rendering and image fusion. 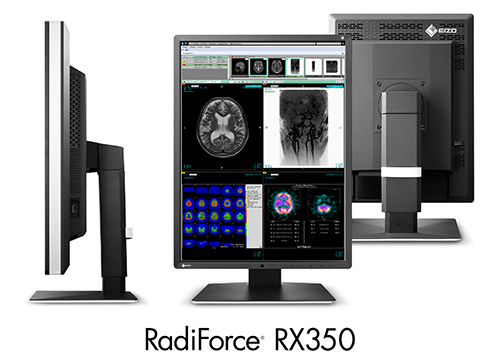 The RadiForce RX350 is the successor model to the RadiForce RX340. The new monitor is equipped with EIZO’s unique Sharpness Recovery technology. All high-brightness LCD panels exhibit a decrease in sharpness of the original image due to aperture ratio of the pixels becoming larger. EIZO’s unique technology called Sharpness Recovery restores lost information in contours, resulting in an image shown with maximum clarity. For keeping workspace efficient, the monitor’s width, height, and depth were reduced by 22 mm, 39 mm, and 45.5 mm respectively – a 30% difference compared to its predecessor. The thinner, black front bezels are ideal for viewing the screen in dark reading rooms, making it easier to focus on images, while the original white stripe design around the sides of the monitor presents a fresh, clean aesthetic to promote a comfortable, user-friendly environment. Using the DisplayPort connection on the monitor, users can drive several monitors in a daisy chain sequence. This allows users to configure a multi-monitor setup without the complicated hassle of excessive cabling. The RadiForce RX350 is now shipping. Date of availability may vary by country so please contact the EIZO group company or distributor in your country for details. EIZO will exhibit the RadiForce RX350 at the 2015 Radiological Society of North America (RSNA 2015) in Chicago, Illinois from November 29 - December 3. Visit EIZO booth #1714 to see the product.